To create this one layer card I started by covering my cardbase with a negative heart mask. 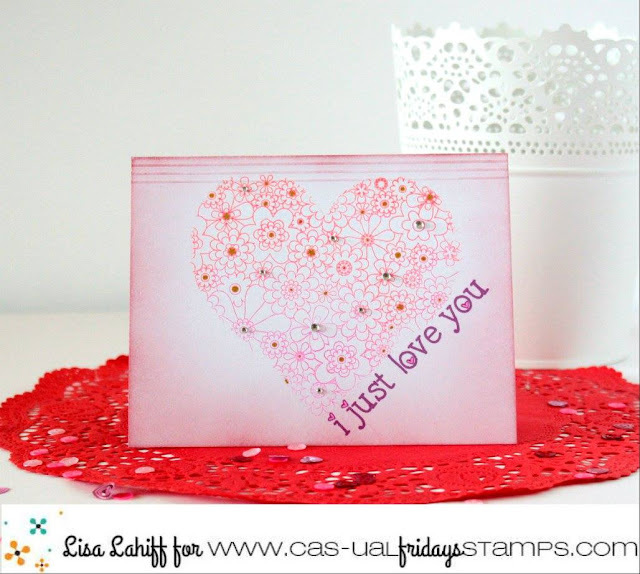 I then used the Full on Floral set to stamp over the open heart area. I used a gradient ink pad for interest. I removed the mask and stamped my sentiment at an angle from the Heartfelt Sayings Set. The card still felt a little plain so added some score lines along the top of the card and some distress ink around the edges. I finished the card off with clear rhinestones, gold metallic pen, and pink sharpie. Such a great new stamp that everyone is using so creatively! Love this card!